According to him, the UGCC also understands itself as the mainstay of civil society. "Civil society has to produce sound politicians, a real genuine political process and active citizens - the builders of the state. It should provide some or other healthy rules for the state economy. If there is no civil society then everything else is planted somewhere from above or from an alien center. That is why the Church in this analysis considers itself to be part of civil society and is called to educate active honest politicians, business people, public activists, those who will really build all the rest of the public, state mechanism, which we call the Ukrainian state,” said the Head of the UGCC. “That is, on the one hand, I think that the place and role of the Church is vital for the state, but on the other – it has its limits. The limits of its competence. 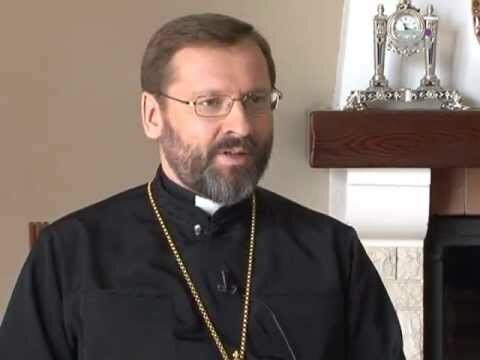 This is what the Church should give this society, this country, these politicians, businesspeople a foundation of values, but it should not engage in politics with politicians,” said Patriarch Sviatoslav (Shevchuk). цінності без особи - річ віртуальна...В час кризи потрібні і провідники з цінностями...бо поки їх будемо формувати..то і завойовник знову державу захопить.... приклади: економ УГКЦ Тит Войнаровський - депутат Австрійського Парламенту, Шептицький - депутат...біля 80 священиків УГКЦ - були депутатами до австрійського та польського сеймів... зараз мало часу на дискусії - потрібно з народом чистити авгієві конюшні... просто виходу немає...немає приклиду для наслідування.